Finding cheap Kenya flights will require a bit of research, but the task is completely doable. Here are four ways that will have you fly to and from Kenya cheaply. There are no direct flights to Kenya from the USA, Canada and Australia. However, you can find many cheap flights on your route. 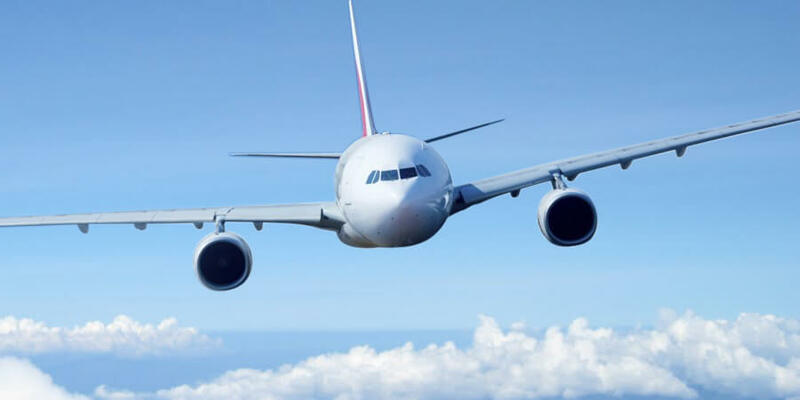 For example, you can find cheap flights from the USA and Canada to London or any other European airport and from there you can book a flight to Kenya. When flying from Australia, you normally get connecting flights in Asia, Middle East or South Africa. From any of these stopovers you can easily get low-cost flights to Kenya. If you have more than one flight to choose from, go with the one that leaves very early in the morning or very late in the evening. This is because these flights are less popular and you are likely to get a bargain. Weekday departures (except Friday departures) are also less popular. Another way to get cheap air tickets is to book your flight outside the tourist high seasons. The tourist high seasons in Kenya are from December to January and from July to August. During the tourist’s off-season accommodation rates are also lower. Whenever you can book your fights as early as possible, this is because the prices go up as the day of departure approaches. According to a study by Airlines Reporting Corporation (ARC). 171 days—about 6 months—in advance of departure for international flights and 57 days—about 2 months—in advance of departure for domestic flights. 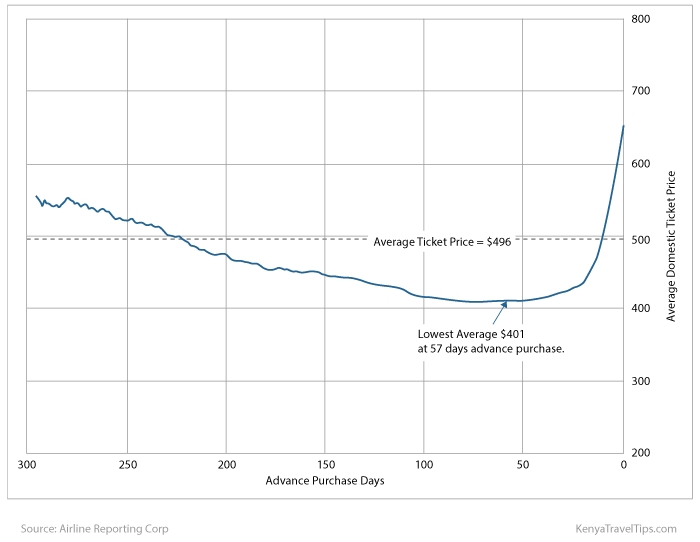 Average Ticket Price vs. Advanced Purchase Days for International Flights. Average ticket price changes very little between 250 and 150 days prior to departure. 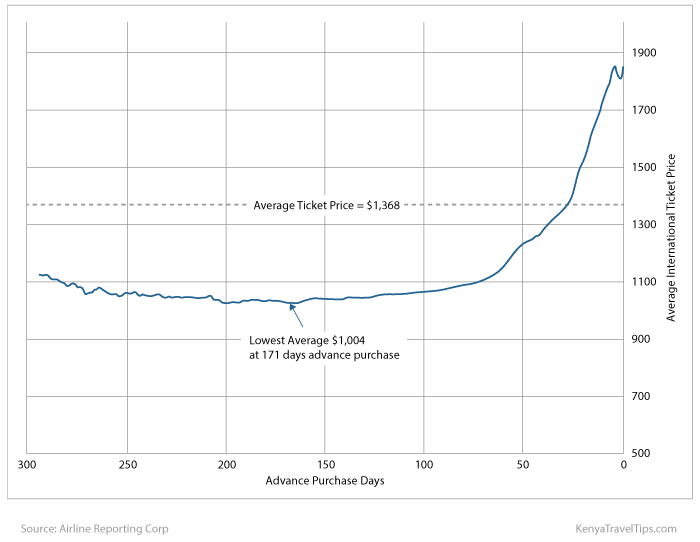 Average Ticket Price vs. Advanced Purchase Days for U.S. Domestic Flights. Average ticket prices changes very little between 100 and 50 days prior to departure. ARC also discovered from its data that the lowest priced airline tickets were purchased on Sunday, regardless of a domestic or international destination. During the traditional Monday through Friday workweek, tickets bought on Tuesday were lowest. Flight search engines enable you to search hundreds of international airlines in one place. One of my favourite is Vayama. They scan more than 450 airlines in seconds and offer you the lowest prices and best schedules. My other favourite search engine is CheapOair. They are especially good if you’re travelling from the United States, Canada or Western Europe. They offer a wide selection of airlines, routes and fares. You can buy flights from travel agents cheaper than buying directly from the airlines because travel agents buy flights in bulk. They sometimes charter an entire plane. The cost of a package or tour with accommodation included can be cheaper than one return ticket. You are not obliged to stay in your accommodation and you can include car hire.